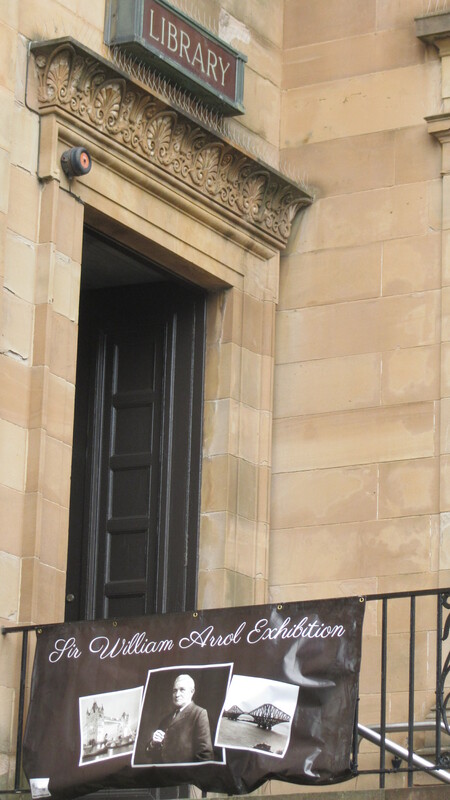 Friends of Seafield House are staging an exhibition, “Sir William Arrol (1839-1913): A Renfrewshire Connection” in the Heritage Centre at Paisley Central Library for the month of July. 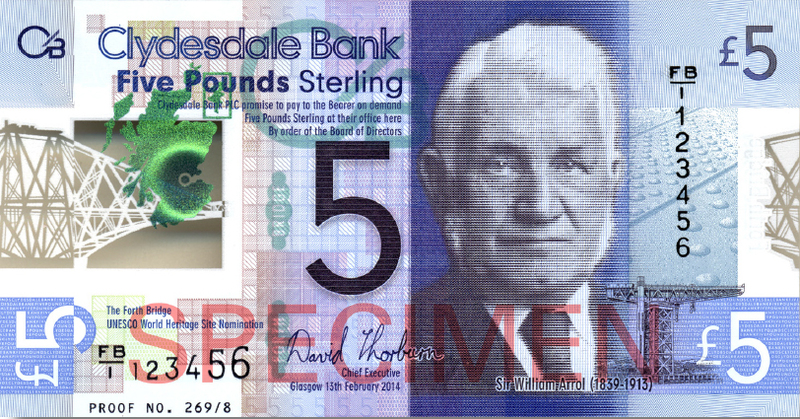 The exhibition was opened on Friday 26th June with the presentation of a commemorative version of Clydesdale Bank’s new £5 polymer banknote, featuring Sir William Arrol and the Forth Bridge. Jamie Martin, Head of Payments at Clydesdale Bank handed over the polymer £5 with a serial number representing Sir William’s birth date, to Ellen Arrol, the oldest family member and a great niece of Sir William. Other family members were delighted to receive a note in a collector’s case. Jamie Martin presenting the banknote to Arrol family. Christian Cooksey/CookseyPix.com on behalf of the Clydesdale Bank and the Big Partnership. Like the introduction of the new £5 polymer note, the exhibition aims to celebrate the nomination of the Forth Bridge for UNESCO World Heritage status. It has been arranged to coincide with the meeting of the World Heritage Committee in Bonn on the 28th June to 8 July when the winning bids will be announced. Fingers crossed that the Forth Bridge will be on that list! The exhibition is also a celebration of Sir William’s strong connections with Renfrewshire. He was born in the village of Houston and grew up in Paisley, where the seed of his engineering prowess developed in his early career. He was also one of the founding directors of the Mo-Car Company which was the first manufacturer of UK automobiles and produced Arrol-Johnston cars in Paisley for many years. When he died Sir William’s body was carried from his home at Seafield House in Ayr to Woodside Cemetery in Paisley, where he was buried. Visitors to the exhibition will be able to find out more about Sir William Arrol’s life and the Forth Bridge from the display boards, library artefacts, iPads with links to relevant websites and there will also be screenings of the film “A River is Spanned” by Harry Birrell, courtesy of the Scottish Screen Archive. The exhibition runs until the 24th July. See the Heritage Centre webpage for opening times and contact details. A huge thanks go to the staff of Renfrewshire Libraries for providing the venue and their fantastic help with the exhibition. The limited production run of the new polymer notes is scheduled to coincide with the 125th anniversary of the opening of the bridge in March 2015, with two million notes to be issued through Clydesdale Bank branches.